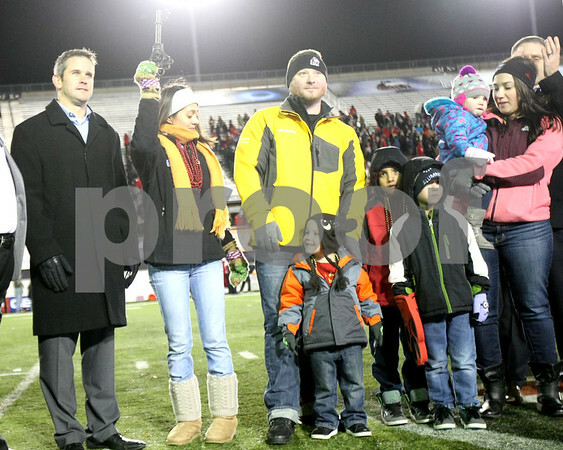 Rocio Ramirez, of Military Warriors Support Foundation, holds up a key – representing a mortgage-free home – before presenting it to Retired Specialist Joseph Yancoskie and his family with Congressman Adam Kinzinger (R-Channahon) (left) during the Northern Illinois versus Toledo football game at Huskie Stadium on Tuesday, November 11, 2014. Yancoskie received a Purple Heart, Combat Action Badge, and an Afghanistan Campaign Medal with 2 Campaign stars for his injuries sustained performing combat missions in Afghanistan. The home is in Lake in the Hills.